For other uses, see Telescope (disambiguation). The word telescope (from the Ancient Greek τῆλε, tele "far" and σκοπεῖν, skopein "to look or see"; τηλεσκόπος, teleskopos "far-seeing") was coined in 1611 by the Greek mathematician Giovanni Demisiani for one of Galileo Galilei's instruments presented at a banquet at the Accademia dei Lincei. In the Starry Messenger, Galileo had used the term perspicillum. The idea that the objective, or light-gathering element, could be a mirror instead of a lens was being investigated soon after the invention of the refracting telescope. The potential advantages of using parabolic mirrors—reduction of spherical aberration and no chromatic aberration—led to many proposed designs and several attempts to build reflecting telescopes. In 1668, Isaac Newton built the first practical reflecting telescope, of a design which now bears his name, the Newtonian reflector. The invention of the achromatic lens in 1733 partially corrected color aberrations present in the simple lens and enabled the construction of shorter, more functional refracting telescopes. Reflecting telescopes, though not limited by the color problems seen in refractors, were hampered by the use of fast tarnishing speculum metal mirrors employed during the 18th and early 19th century—a problem alleviated by the introduction of silver coated glass mirrors in 1857, and aluminized mirrors in 1932. The maximum physical size limit for refracting telescopes is about 1 meter (40 inches), dictating that the vast majority of large optical researching telescopes built since the turn of the 20th century have been reflectors. The largest reflecting telescopes currently have objectives larger than 10 m (33 feet), and work is underway on several 30-40m designs. The 20th century also saw the development of telescopes that worked in a wide range of wavelengths from radio to gamma-rays. The first purpose built radio telescope went into operation in 1937. Since then, a large variety of complex astronomical instruments have been developed. The name "telescope" covers a wide range of instruments. Most detect electromagnetic radiation, but there are major differences in how astronomers must go about collecting light (electromagnetic radiation) in different frequency bands. As wavelengths become longer, it becomes easier to use antenna technology to interact with electromagnetic radiation (although it is possible to make very tiny antenna). The near-infrared can be collected much like visible light, however in the far-infrared and submillimetre range, telescopes can operate more like a radio telescope. For example, the James Clerk Maxwell Telescope observes from wavelengths from 3 μm (0.003 mm) to 2000 μm (2 mm), but uses a parabolic aluminum antenna. On the other hand, the Spitzer Space Telescope, observing from about 3 μm (0.003 mm) to 180 μm (0.18 mm) uses a mirror (reflecting optics). Also using reflecting optics, the Hubble Space Telescope with Wide Field Camera 3 can observe in the frequency range from about 0.2 μm (0.0002 mm) to 1.7 μm (0.0017 mm) (from ultra-violet to infrared light). With photons of the shorter wavelengths, with the higher frequencies, glancing-incident optics, rather than fully reflecting optics are used. Telescopes such as TRACE and SOHO use special mirrors to reflect Extreme ultraviolet, producing higher resolution and brighter images than are otherwise possible. A larger aperture does not just mean that more light is collected, it also enables a finer angular resolution. Telescopes may also be classified by location: ground telescope, space telescope, or flying telescope. They may also be classified by whether they are operated by professional astronomers or amateur astronomers. A vehicle or permanent campus containing one or more telescopes or other instruments is called an observatory. The refracting telescope which uses lenses to form an image. The reflecting telescope which uses an arrangement of mirrors to form an image. The catadioptric telescope which uses mirrors combined with lenses to form an image. A Fresnel Imager is a proposed ultra-lightweight design for a space telescope that uses a Fresnel lens to focus light. Beyond these basic optical types there are many sub-types of varying optical design classified by the task they perform such as astrographs, comet seekers and solar telescopes. 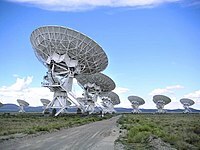 Radio telescopes are directional radio antennas that typically employ a large dish to collect radio waves. The dishes are sometimes constructed of a conductive wire mesh whose openings are smaller than the wavelength being observed. Unlike an optical telescope, which produces a magnified image of the patch of sky being observed, a traditional radio telescope dish contains a single receiver and records a single time-varying signal characteristic of the observed region; this signal may be sampled at various frequencies. In some newer radio telescope designs, a single dish contains an array of several receivers; this is known as a focal-plane array. By collecting and correlating signals simultaneously received by several dishes, high-resolution images can be computed. Such multi-dish arrays are known as astronomical interferometers and the technique is called aperture synthesis. The 'virtual' apertures of these arrays are similar in size to the distance between the telescopes. As of 2005, the record array size is many times the diameter of the Earth — utilizing space-based Very Long Baseline Interferometry (VLBI) telescopes such as the Japanese HALCA (Highly Advanced Laboratory for Communications and Astronomy) VSOP (VLBI Space Observatory Program) satellite. Aperture synthesis is now also being applied to optical telescopes using optical interferometers (arrays of optical telescopes) and aperture masking interferometry at single reflecting telescopes. Radio telescopes are also used to collect microwave radiation, which has the advantage of being able to pass through the atmosphere and interstellar gas and dust clouds. Some radio telescopes are used by programs such as SETI and the Arecibo Observatory to search for extraterrestrial life. X-rays are much harder to collect and focus than electromagnetic radiation of longer wavelengths. X-ray telescopes can use X-ray optics, such as Wolter telescopes composed of ring-shaped 'glancing' mirrors made of heavy metals that are able to reflect the rays just a few degrees. The mirrors are usually a section of a rotated parabola and a hyperbola, or ellipse. In 1952, Hans Wolter outlined 3 ways a telescope could be built using only this kind of mirror. Examples of observatories using this type of telescope are the Einstein Observatory, ROSAT, and the Chandra X-Ray Observatory. By 2010, Wolter focusing X-ray telescopes are possible up to photon energies of 79 keV. Higher energy X-ray and Gamma-ray telescopes refrain from focusing completely and use coded aperture masks: the patterns of the shadow the mask creates can be reconstructed to form an image. X-ray and Gamma-ray telescopes are usually installed on Earth-orbiting satellites or high-flying balloons since the Earth's atmosphere is opaque to this part of the electromagnetic spectrum. An example of this type of telescope is the Fermi Gamma-ray Space Telescope. The detection of very high energy gamma rays, with shorter wavelength and higher frequency than regular gamma rays, requires further specialization. An example of this type of observatory is VERITAS. A discovery in 2012 may allow focusing gamma-ray telescopes. At photon energies greater than 700 keV, the index of refraction starts to increase again. Cosmic-ray telescopes detect cosmic rays and usually consist of an array of different detector types spread out over a large area. Energetic neutral atom instruments study the magnetosphere of various bodies by detecting fast moving electrically neutral atoms created by the solar wind. Neutrino detectors, the equivalent of neutrino telescopes, used for neutrino astronomy. They consist of a large mass of water and ice, surrounded by an array of sensitive light detectors known as photomultiplier tubes. Originating direction of the neutrinos is determined by reconstructing the path of secondary particles scattered by neutrino impacts, from their interaction with multiple detectors. Since the atmosphere is opaque for most of the electromagnetic spectrum, only a few bands can be observed from the Earth's surface. These bands are visible – near-infrared and a portion of the radio-wave part of the spectrum. For this reason there are no X-ray or far-infrared ground-based telescopes as these have to be observed from orbit. Even if a wavelength is observable from the ground, it might still be advantageous to place a telescope on a satellite due to astronomical seeing. A diagram of the electromagnetic spectrum with the Earth's atmospheric transmittance (or opacity) and the types of telescopes used to image parts of the spectrum. Different types of telescope, operating in different wavelength bands, provide different information about the same object. Together they provide a more comprehensive understanding. ^ Company, Houghton Mifflin Harcourt Publishing. "The American Heritage Dictionary entry: TELESCOPE". www.ahdictionary.com. 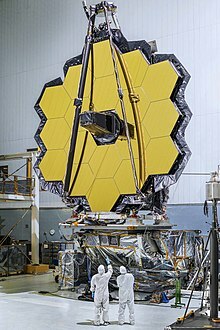 ^ "NASA - Telescope History". www.nasa.gov. ^ Loker, Aleck (20 November 2017). Profiles in Colonial History. Aleck Loker. ISBN 978-1-928874-16-4 – via Google Books. ^ Watson, Fred (20 November 2017). Stargazer: The Life and Times of the Telescope. Allen & Unwin. ISBN 978-1-74176-392-8 – via Google Books. ^ "Jean-Bernard-Léon Foucault Biography (1819-1868)". www.madehow.com. ^ "Home" (PDF). Cambridge University Press. ^ ASTROLab du parc national du Mont-Mégantic (January 2016). "The James-Clerk-Maxwell Observatory". Canada under the stars. Retrieved 2017-04-16. ^ "Hubble's Instruments: WFC3 - Wide Field Camera 3". www.spacetelescope.org. Retrieved 2017-04-16. ^ Jones, Barrie W. (2 September 2008). The Search for Life Continued: Planets Around Other Stars. Springer Science & Business Media. ISBN 978-0-387-76559-4. ^ a b "NuStar: Instrumentation: Optics". Archived from the original on 2010-11-01. ^ Wolter, H. (1952), "Glancing Incidence Mirror Systems as Imaging Optics for X-rays", Annalen der Physik, 10 (1): 94–114, Bibcode:1952AnP...445...94W, doi:10.1002/andp.19524450108. ^ Wolter, H. (1952), "Verallgemeinerte Schwarzschildsche Spiegelsysteme streifender Reflexion als Optiken für Röntgenstrahlen", Annalen der Physik, 10 (4–5): 286–295, Bibcode:1952AnP...445..286W, doi:10.1002/andp.19524450410. ^ a b "Silicon 'prism' bends gamma rays – Physics World". 9 May 2012. Sabra, A.I. ; Hogendijk, J.P. (2003). The Enterprise of Science in Islam: New Perspectives. MIT Press. pp. 85–118. ISBN 978-0-262-19482-2. Taylor, Harold Dennis; Gill, David (1911). "Telescope" . Encyclopædia Britannica. 26 (11th ed.). pp. 557–573.